This Tibbit is based on the SIM900 GPRS modem manufactured by SIMCOM. The Tibbit is implemented as the H2 hybrid device. An external antenna (not included with the Tibbit) connects to the SMA type connector located on the front of this hybrid Tibbit. The use of external antenna is a must -- the Tibbit will not be able to operate without it. There is also a standard stereo phone jack, which can accommodate regular mobile phone headsets. With the right application controlling the modem through AT commands this Tibbit will be able to make voice calls as well! 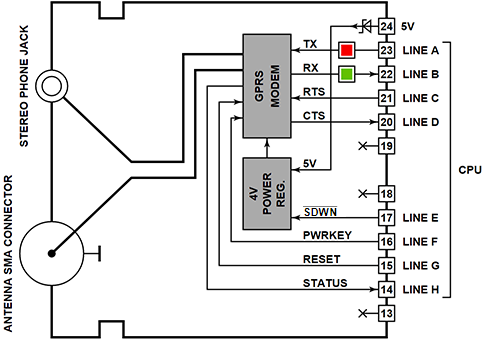 The modem has standard TX, RX, RTS, and CTS signals, plus several additional lines. The -SHDN (shutdown) line, when LOW, turns off the power regulator of the Tibbit. When the line is switched HIGH the power regulator is re-enabled but the modem remains in the off state. Toggle the PWRKEY line (see below) to turn on the modem. The PWRKEY (power key) line toggles the power on and off. A HIGH-to-LOW transition on this line flips the power: turns the Tibbit on if it was off, and off if the Tibbit was on. This control method is highly inconvenient but is somehow used on all GPRS modems. There are two methods of finding out whether the modem is currently on or off: by sending an AT command and checking for a response, or by querying the state of the STATUS line (see below). The RESET line is active high. Bringing the line HIGH for about one second resets the modem. There is no need to reset the Tibbit after turning on its power. The STATUS line is LOW when the modem is off and HIGH when the modem is on. The line can be used to check the current power state of the modem. The SIM card holder is located on the bottom of the Tibbit. This means that in order to insert or remove the SIM you must first open up the TPS and then remove the Tibbit from the Tibbo Project PCB. We chose this relatively inaccessible SIM card location to lower the chances of the SIM getting stolen. While it is still possible to get to the SIM card, doing so requires quite a bit of time and work, thus making it impossible to remove the card "in a flash". There is one red and one green LED. The red LED is connected to the TX line, the green LED -- to the RX line. Remaining lines are not equipped with LEDs because of the board space constraints. Tibbit #47 consumes a modest average current of 300mA but has the peak current consumption of 1.5A. The current "spikes" are so narrow that they can't be seen on a regular multimeter. Nevertheless, they are present and occur regularly when the GPRS link is established. To prevent reboots and unstable operation make sure that you use an adequate power source. At this time, the TPS platform only offers two power supply Tibbits capable of providing the required surge current -- Tibbit #23 (PoE) and #25 (12/24/48V). Tibbit #25 will only be able to sustain the GPRS modem when powered from the 24V or higher voltage. The Online Configurator (http://tibbo.com/buy/tps/tpc.html) lists Tibbit #47 as consuming 850mA of current. This is because the Configurator does not account for surge currents and only specifies the average current consumption for each Tibbit. We found 800mA to be a good approximation of the current burden that the GPRS Tibbit puts on the power source. 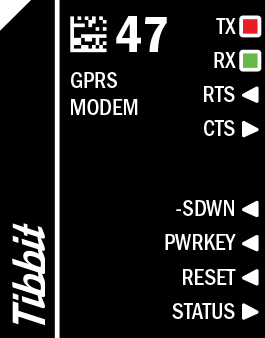 The easiest way to incorporate the Tibbit #47 into your project is by using our official GPRS library (http://docs.tibbo.com/taiko/lib_gprs.htm). We've published a small project that illustrates the use of this library. You can find it here: http://tibbo.com/basic/resources/examples/test_gprs_lib.html.